The Soka Gakkai was founded in 1930 by Tsunesaburo Makiguchi and his protégé Josei Toda. Both were educators, and Makiguchi, already in his late 50s when he met Nichiren Buddhism, had devoted much of his life to educational reform. He developed a pedagogy that was based on his belief that children's happiness was the purpose of education. In Nichiren Buddhism he found a philosophy that resonated strongly with his own ideas. 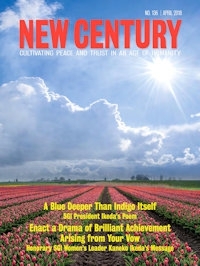 He was particularly inspired by Nichiren's concern with social reform. During the Second World War, the Japanese militarist government imprisoned Makiguchi and Toda as "thought criminals" for their opposition to its policies. Makiguchi, then in his 70s, succumbed to malnutrition and died in prison. On his release from prison in 1945, Toda reestablished the Soka Gakkai, building it into an organization of almost one million members by the time of his death in 1958. Toda's disciple, Daisaku Ikeda, was instrumental in this postwar development of the Soka Gakkai. In 1960, at the age of 32, he succeeded Toda as president of the organization. Under his leadership, the Soka Gakkai saw further dramatic development, taking root outside of Japan. 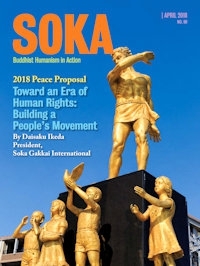 In 1975, Ikeda established the Soka Gakkai International.